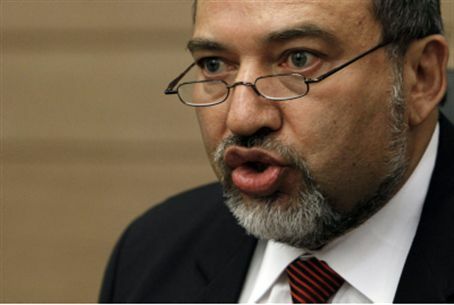 FM Avigdor Lieberman: the media has 'a very rich imagination' about a potential Israeli strike on Iran; Israel not using Azeri airbases. Foreign Minister Avigdor Lieberman on Monday told reporters in the Azeri capital Baku that Israel does not have airbases in the country. "Such reports are from the sphere of science fiction and do not correspond with the truth," Lieberman said during a press conference. "People with a very rich imagination publish such stories ... Media publish [sic] a lot of speculation." Lieberman told reporters he and Azeri President Ilham Aliyev discussed bilateral relations, as well as the "issue of Iran," but did not go into details. "Relations with Azerbaijan could not be better. They are trusting and productive," he said. Azerbaijan is a predominantly Shiite Muslim country of 9 million with a secular government that has friendly ties with Israel. Israel has a $1.6 billion deal with Azerbaijan to provide some 60 state-of-the-art UAVs and is Baku's second largest consumer of exportable crude oil. Iran has accused Azerbaijan - which has a Jewish population of 9,000 - of assisting Israeli intelligence in killings of Iranian nuclear scientists. Last month, security forces arrested several Azeris and Iranians on suspicion of spying for Iran, plotting to attack Western targets and smuggling arms from Iran into Azerbaijan. Meanwhile, there has been media speculation since last month that Israel would seek to use Azerbaijan as a launching ground for potential attacks on Iran's nuclear facilities. The US journal Foreign Policy last month cited sources as saying the United States has concluded that Israel has recently been granted access to air bases on Iran's northern border. “We're watching what Israel is doing in Azerbaijan. And we're not happy about it,” a US official told the magazine last month. However, officials in Baku have emphatically said no airstrike on Iran will be mounted from their territory. "Azerbaijan's territory will never be used to launch an attack against its neighbor, Iran," Aliyev's office said in a statement. Analysts say, however, that Aliyev's statement does not specifically preclude Israel staging search-and-rescue missions into Iran in the event any of its planes are shot down in the course of a potential military strike on Tehran's nuclear program. Israel, the United States, its European allies, and Gulf Arab nations maintain Iran is pursuing nuclear weapons in violation of the Nuclear Non-Proliferation Treaty - to which Tehran is a signatory. Defense Minister Ehud Barak last week said military action to ensure Iran does not obtain nuclear weapons "remains an option," should nuclear talks between Iran and the P5+1 fail to yield fruit.